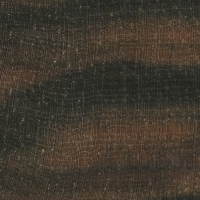 Color/Appearance: Heartwood ranges from a medium brown to nearly black. Commonly with black veining and contrasting brown or reddish streaks. 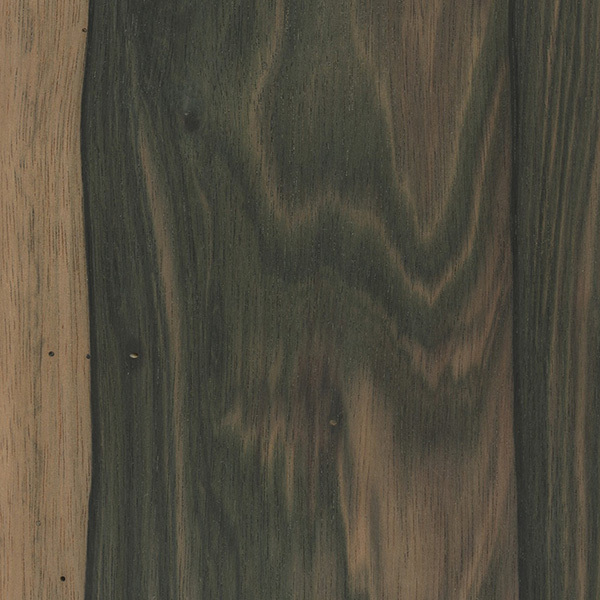 Heartwood can also have a greenish hue. 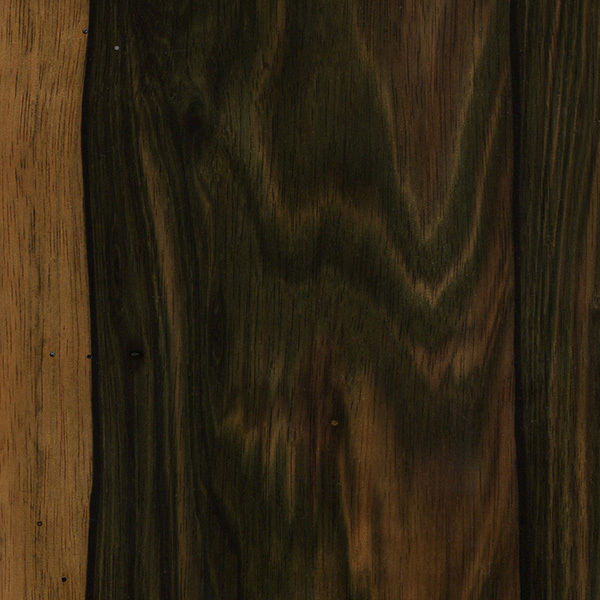 Sharply demarcated sapwood is a pale yellow to tan color, and is typically present on most pieces. Insect holes, particularly in the sapwood, are common. Grain/Texture: Grain is generally straight, with a very fine, even texture and good natural luster. Rot Resistance: No data available; most likely very durable like other true ebonies in the Diospyros genus. Workability: Tends to be rather difficult to work, due to its high density, blunting effect on cutters. The wood is also prone to checking and splitting during drying, and drying defects are not uncommon. Tends to be difficult to steam bend. Turns well. Allergies/Toxicity: Although severe reactions are quite uncommon, ebony in the Diospyros genus has been reported as a sensitizer. Usually most common reactions simply include eye, skin, and respiratory irritation. See the articles Wood Allergies and Toxicity and Wood Dust Safety for more information. 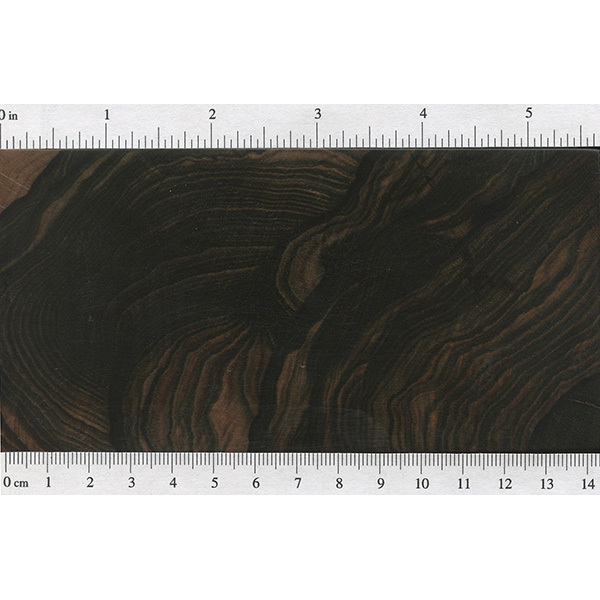 Pricing/Availability: Seldom available, Malaysian Blackwood is very expensive, just as expensive as any solid-black piece of true ebony. The wood is usually sold as guitar sets, or as small turning blanks. Sustainability: This wood species is not listed in the CITES Appendices or on the IUCN Red List of Threatened Species. 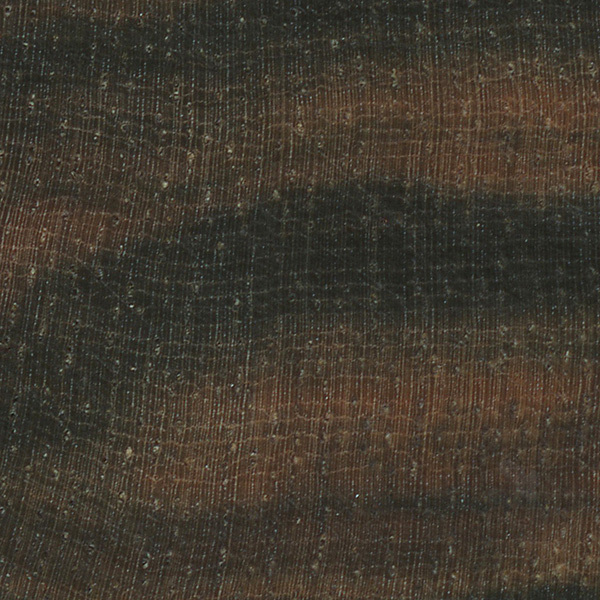 However, because the scientific name Diospyros ebonasea is unverified, the wood may actually be a different species. Many Diospyros species are listed as vulnerable or endangered. Common Uses: Acoustic guitars, turned objects, knife handles, and inlay. 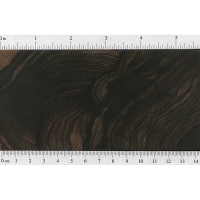 Comments: The term blackwood may be an unnecessarily modest appellation, as this wood is classified as a true ebony in the Diospyros genus, and it’s price and scarcity fully reflect that. However, the actual scientific name Diospyros ebonasea is, as of yet, completely unsubstantiated. It’s more than likely another known Diospyros species. 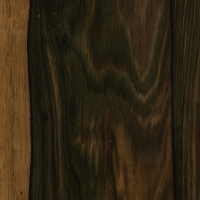 Nonetheless, despite the semantic quirks of the wood’s common and scientific names, Malaysian Blackwood remains a remarkably beautiful hardwood with unique patterns and coloration that are in a class by itself. 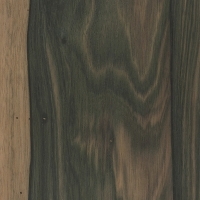 Malaysian Blackwood is also favored for acoustic guitars, and is said to be an excellent tonewood.